Ht = 192, seat L = 224, W = 77, th = 7; pedestal max W = 57, th = 15, diam hole = 7, base L = 85.5, W = 84, th = 26; carrying loop L = 115, W = 10.5, th = 9.5 mm [RTS 11/4/2005]. Headrest carved from a single piece of yellowish brown wood (Pantone 7509C), stained an orangey red colour in places (Pantone 469C). This consists of a narrow seat at the top that has a bilobed plan view - that is, strongly concave down the long sides but swelling out to convex ends, each with a shallow concave section cut out of their centre. The seat is slightly convex across the width, and markedly concave along the length, and has a slightly convex underside with a tall pedestal foot extending from its centre. The pedestal has a narrow, rectangular sectioned body with concave sides making a convenient, hand-sized grip, before turning sharply in again just above the base. The base itself has a conical upper part that slopes down to a thick, flat sided edge, with a deeply conical concavity on the underside. The pedestal has been pierced at top and bottom, and a carrying loop fitted through the holes. The loop itself is made from several narrow strips of hide plaited together using a herringbone technique, in which the strips are perforated along their lengths and interwoven with one another; the resultant handle is in this case square sectioned, and probably made from four strips. These seem to have been originally yellow (Pantone 7508C) but are largely covered in brown dirt. At the top end, this has been fitted through a short hide loop that passes through the hole in the pedestal to be secured with a knot on the other side. At its base, however, the original hide loop is missing, and has been replaced with a strip of greenish gray tightly woven textile, also knotted at the end (Pantone 451C). The seat is complete and intact, but has a flaw in the wood on one side of the foot that has left a notch in the surface. It has a weight of 364.6 grams, and is 192 mm high; the seat is 224 mm long, 77 mm wide and 7 mm thick; the pedestal has a maximum width of 57 mm and is 15 mm thick, with a hole diameter of 7 mm, while the base is 85.5 mm long, 84 mm wide and 26 mm thick, and the carrying loop is 115 mm long, 10.5 mm wide and 9.5 mm thick. This object was collected by Brian John Mack when working amongst the Toposa in the Southern Sudan in 1980. He did not record its local name. It appears to have been accessioned retrospectively as part of Patti Langton's collection later that year, using the same group number assigned to material from her 1979 expedition, which Mack had been a part of. However his 1980 fieldwork appears to have been undertaken independently of Langton, although she was working amongst the nearby Boya at the same time. John Mack discusses South Sudanese headrests, commenting that in recent times they are found amongst transhumant groups who use them to protect elaborate hairstyles, and that this particular type of headrest is used by the Toposa, Didinga and Larim in Sudan, and also across a wide area of northern Uganda, Kenya and in adjacent areas of Ethiopia. The variety with semicircular cut-outs of the seat edges, as seen here, is more restricted in distribution to the Toposa and Larim. Personal items such as knives and tobacco containers are sometimes attached to the central pedestal (J. Mack, 1982, "Material Culture and Ethnic Identity in Southeastern Sudan", p. 117). Discussions of the Toposa may be found by Captain G.R. King in L.F. Nalder (ed. ), 1937, A Tribal Survey of the Mongalla Province, pp 65-81 and A.C. Beaton, 1950, "Record of the Toposa Tribe", Sudan Notes and Records XXXI . 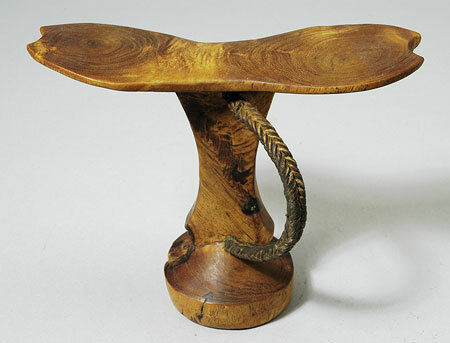 A similar object is discussed by Trowell and Wachsmann, who state that the Karamoja and Acholi of Uganda use stools as headrests to support elaborate hairstyles, often hardly bigger than a man's hand, with a top curved to fit the neck with a strap to allow it to be carried on the arm (M. Trowell & K.P. Wachsmann, 1953, Tribal Crafts of Uganda, p. 157, see especially pl. 34F). The southern Larim also use this style of headrest - see 1979.20.172-173 for very similar examples. Patti Langton reported that the design of those was supposedly copied from the Ugandan dodos (see 1979.20.174), that the local name for this type of object is teget , and they were used by men for sitting or sleeping. The hollowed base was sometimes used as a storage compartment for fat, which would be used to oil the headrest before using it (see entry for 1979.20.172). Accession Book Entry [p. 185] - 1979.20 (.1 - 206) P[urchase] MISS PATTI LANGTON, DEPT. of ETHNOLOGY & PREHISTORY, OXFORD. Collection made by Patti Langton during the British Institute in East Africa's expedition to the Southern Sudan; Jan. - April 1979. The collection was made in three culture areas during the dry season. The amount paid for each object is listed if the information is known. In Jan. 1979 £1 is equivalent to 95 piastres (pt.) Sudanese. This documentation is based largely upon Patti's own list of objects and her notes on these. Sometimes objects included in the Pitt Rivers alottment of the collection do not appear on her list and have been added here. See Related Documents file as well. [p. 214] 1979.20.194 - SOUTHERN SUDAN TOPOSA Collected in 1980 and sent via John Mack, Mus. of Mankind [p. 215] 1979.20.201 Wooden headrest on round base. Thick plaited leather carrying strap. L. top = 22.3 cm. ; H = 18.5 cm. Additional Accession Book Entry [below accession number in red biro] - A6-F25-6. Pitt Rivers Museum label - S.SUDAN, TOPOSA. Headrest. Coll. by Pat Langton 1979.20.201 [plastic label with metal eyelet, tied to object; RTS 9/4/2005]. Written on object - TOPOSA Langton [ink, base]; TOPOSA P. LANGTON COLL. 1979.20.201 [ink, base; RTS 9/4/2005]. Sparks, Rachael. "Toposa headrest" Southern Sudan Project (in development). 03 Jan. 2006. Pitt Rivers Museum. <http://southernsudan.prm.ox.ac.uk/details/1979.20.201/>.